The magi of the Order of Hermes are not the only scholars and artists in Mythic Europe. In the Greek and Muslim lands, traditions of learning stretch back unbroken over centuries, while scholarship has emerged from long centuries of neglect in the Latin West with great vigor. From parish schools to the new universities, learning and creativity are everywhere. Nor is this learning entirely theoretical. Doctors can cure many illnesses, and preserve the health of their charges. Natural philosophers can manipulate substances in a way that appears magical to the ill-informed, and gain some hints as to the future from the positions of the stars. The natural laws of Mythic Europe are very different from those of our world, and many strange things can be achieved by those who understand their secrets. Artists create the great cathedrals, but also more humble paintings, songs, and sculptures. The greatest of them draw the attention of the supernatural, and become part of the legends of the land. Art & Academe provides background on the academic life of Mythic Europe, and rules for activities reaching from the astrology and alchemy of the natural philosopher to the regimens and treatments of the medic, from university disputations to the creation of masterpieces of art. 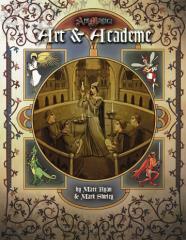 Art & Academe takes your saga to the very limits of medieval scientific knowledge.